But Professor Higgins was only half wrong. That is, all human brains, male and female, are prone to the cotton-hay-and-rags syndrome. Throughout the millennia, humans have been wrong about so much, and—sorry, Professor Higgins—men have been the major culprits. We can blame the men especially for the monotheism represented in the Bible—a major mess of contradictions, if ever there was one. But the fault lies not with gender, but with the brains that we owe to the clumsy evolutionary process. We have to work hard to outsmart our brains. Our intelligence has its origins in what Guy P. Harrison has called “this amazing three-pound electrochemical blob” that is housed in our skulls. And it is an uphill battle, Harrison urges, a major challenge, for us to come to terms with the brain’s capacity to fool us. Humans have proved so abundantly that it is easy for us to roll with wrong answers, religion being Exhibit A.
I always try to coax believers back to the brutal truth that there are no data about god(s)—if we think like scientists, that's what we want—and poor reasoning leads them to make too much of personal feelings, visions and prayers to anchor claims about the divine realm. Please, think it through, people. The foundation that Harrison advocates he calls Good Thinking, which is “…my umbrella term for understanding, appreciating, caring for, and using the human brain in ways that enable one to better avoid lies, mistakes, and delusions, instead of repeatedly running toward them with open arms. Good Thinking reduces one’s error rate over a lifetime. It includes thinking like a scientist in daily life.” (The title of one of his books is Good Thinking: What You Need to Know to be Smarter, Safer, Wealthier, and Wiser. This attachment to absurdities is a stark reality. When I bumped into fundamentalists when I was in college, I found it impossible to penetrate their worldview. Only years later would I hear it summed up so perfectly by Al Stefanelli: “Arguing with a creationist is like trying to teach calculus to a toaster.” Leave it to Harrison, however, to correctly analyze elements missing in their thinking—indeed in the thinking of all those who are locked into any doctrine or dogma, liberal or conservative. 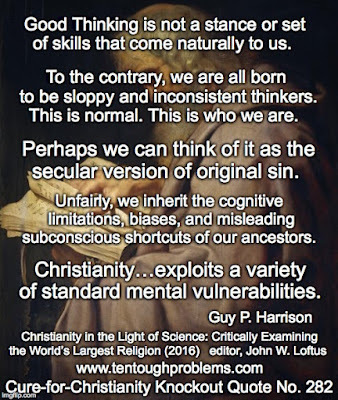 In one major section of his essay, he presents seven “minimal requirements for Good Thinking.” Those of us who engage with Christian apologists can benefit from reviewing these points, if for no other reason than to enhance our own thinking skills and avoid the traps that our brains set for us. I won’t list all seven—upon which he elaborates—but the first couple offer a glimpse at his practical approach: Know Basic Brain Structure and Function, and Appreciate How Brains Evolved. Harrison’s mantra is learning how to think like a scientist, and, citing the example of how careful people can be when they buy a car, he makes the point that this attitude should prevail when testing any idea. 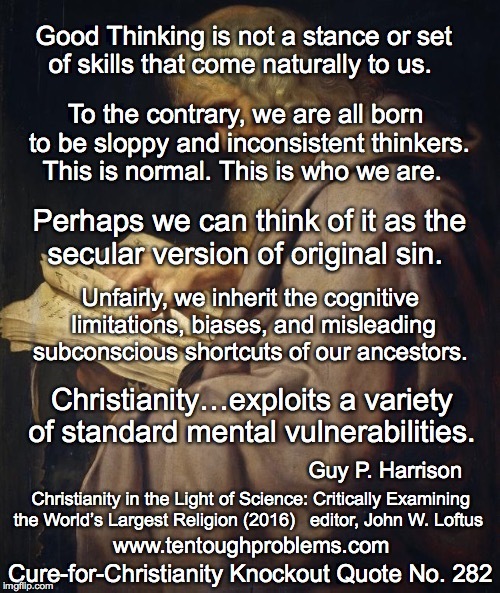 Harrison, by the way, is one of the atheist authors whom I recommend the most. His 50 Reasons that People Give for Believing in a God is an outstanding classic. Anyone who is wondering what books on atheism to recommend, this is a good bet. Its calm tone and common sense approach are likely to move people in our direction.